Leading National Non-Governmental Organization Swabi Khyber Pakhtunkhwa. MBBS with 2 year experience in supervisory role in MNCH. Experience in data analysis and good report writing skills. MBBS with PMDC registration. 2 year experience in BEmOC services. Ability to manage obstetrics/ Gynecology at primary health care services. Experience in Obstetrics ultrasonography. Diploma in nursing/LHV. 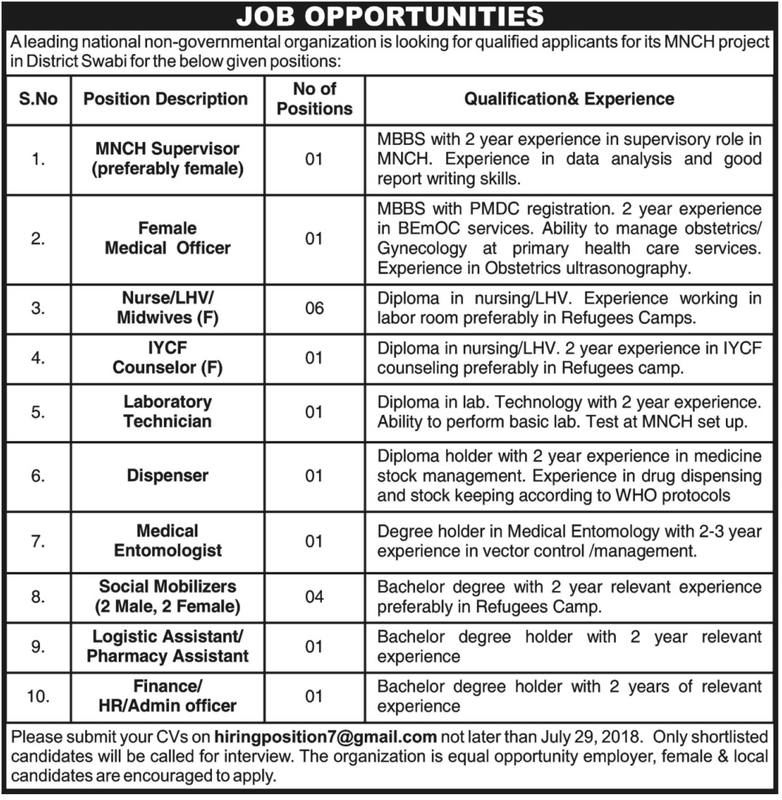 Experience working in labor room preferably in Refugees Camps. Diploma in nursing/LHV. 2 year experience in IYCF counseling preferably in Refugees camp. Diploma in lab. Technology with 2 year experience. Ability to perform basic lab. Test at MNCH set up. Diploma holder with 2-year experience in medicine stock management. Experience in drug dispensing and stock keeping according to WHO protocols. Degree holder in Medical Entomology with 2-3 year experience in vector control /management. Bachelor degree with 2-year relevant experience preferably in Refugees Camp. Please submit your CVs on hiringposition7@gmail.com not later than July 29, 2018. Only shortlisted candidates will be called for interview. The organization is equal opportunity employer, female & local candidates are encouraged to apply.